Using bleeding edge distributions has the charm of getting all the great new stuff prior to anyone else. Such as conky 1.10, which comes with an entirely new and shining configuration syntax. Yippee ki-yay etc. etc. Naturally, I first got 1.10 on my three Arch-based systems. 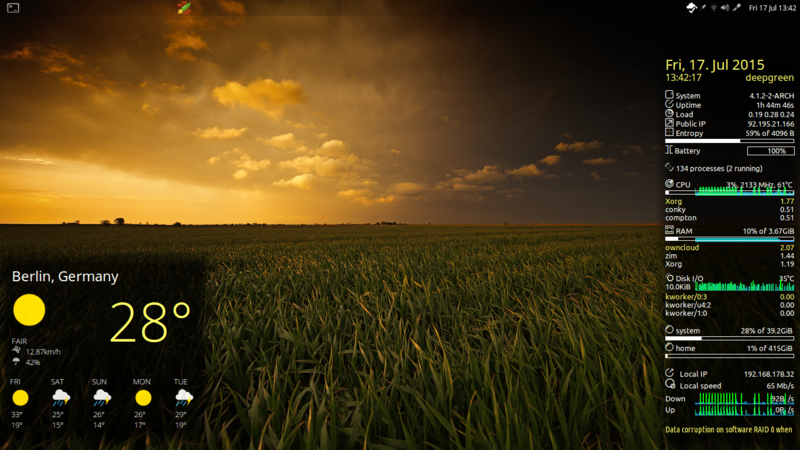 Upon startup, conky tried to convert the previous config on the fly, but failed to do so. A manual conversion via convert.lua also failed. Grmpf. Well, I thought, the new Lua syntax doesn't seem to be that different from the old one. I thus edited my config file and changed all entries according to the new rules. Took me about 10 min. Still plenty of time till the beginning of my next meeting! Let's start conky with its new config and iron out the few remaining wrinkles in the remaining 5 min. Come on, girls. Why don't you start a new branch of Conky (2?) and keep the old one (1.9) as stable? Why forcing the new Lua syntax down the throats of everybody, including people like me who don't have the time to pamper immature and bawling software like yours?